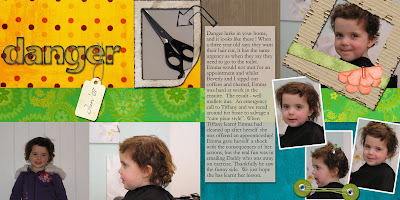 Well I put my time to better use and scrapped the pictures of my daughter’s self inflicted hair cut. This happened last winter. My M-I-L was up to look after the kids because hubby was away on exercise and I was going somewhere to see a client. Anyway on this day my daughter had said she would like to get her fringe cut, and I said I would make an appointment. She headed off to play in the play room and my M-I-L and I grabbed a coffee. I heard my daughter go through to our bedroom, and figured she was just playing with my shoes (she had a shoe fetish since she started walking). A short while later she came out and I noticed her fringe (it was GONE), so I called her over and as I stroked her head great clumps of hair came falling out. Not only had she cut the fringe but great chunks around her ears. Thank goodness for whatever angel was watching over her that day because she could easily have done damage with the scissors. It turned out my husband had left a pair of scissors in with his clippers that she had found. She had totally tidied up after herself though, all that beautiful hair, all those gorgeous curls were neatly in the bin in our ensuite. I phoned my hair dresser who said to bring her straight in and they “salvaged” a cute pixie cut from the horrid mullet she had given herself. We emailed a picture of the scissors to my husband first, and the story of what had happened. The funniest part of this is that when we picked up my son from school and asked if there was anything different about his sister, he looked then stated “she is wearing gloves”. As I said at the time, hair will grow back, but male blindness is forever. SIGH. Anyway I had to scrap these pictures, and thought I would jump out of my comfort zone with Vicki’s Citrus Berry, and the alpha is from her dandelion dreams kit. I have put together some of the items I have been making over the last few days for layouts here, there are a couple of extra things in there I forgot to put on the preview. SO funny! My daughter did the same thing when she was 3 - I had put her hair in fancy banana curls for Easter, and she looked adorable. Well, she was so fascinated with those curls, that she took the safety scissors and cut her curls off at the ears! It was a horrible mullet! Somewhere, I have pictures of the incident - I'll send them to you if I can find them! my dd did this last year at age three also! luckily, she just cut a fringe and didn't go too much farther. we've been trying to grow it out ever since. I LOVE your layouts of your daughter's cute haircut. What could be worse then a child cutting off their pretty hair??? Having a sweet little girl with curls cut off another girl's hair. Yep, my granddaughter did. The Mom's were having a meeting and the girl told my DGD she wanted her hair cut so my DGD did it for her. My DIL was mortified and the other mother was upset, but it all ended well. LOL Wish I had some pictures to scrap.